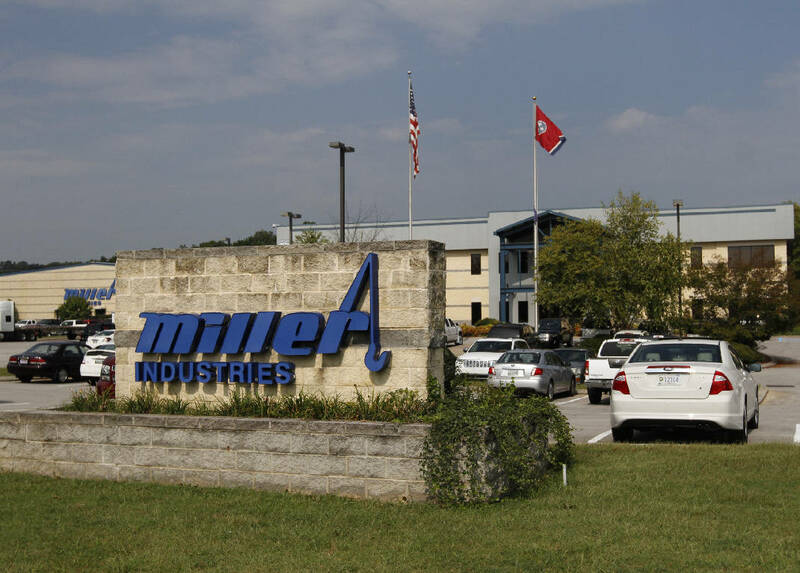 The Ooltewah, Tenn., branch of Miller Industries Inc. is shown on Sept. 12, 2013. Miller Industries' co-chief executive on Thursday cited the Chattanooga-based tow-truck maker's track record as a publicly traded company for helping it earn a business ethics award. "We've been publicly traded since 1994 with a perfect track record from an ethical and financial filing standpoint," said co-CEO Will Miller about the company that's now up to 600 employees in the city. The BBB of Southeast Tennessee and Northwest Georgia gave Torch Awards for Marketplace Ethics to four companies and a nonprofit at its annual meeting. Also, 10 students in the area received Integrity Awards and scholarships after writing essays on the issue of ethics. Miller said the company now has about 1,000 workers, including the 600 at its Ooltewah production facility and headquarters. The towing equipment maker has boosted its local staff by 20 percent over the past two years. "Business is doing well," Miller said. "We had a great start to the year in the first quarter and look forward to a strong year." Miller said that among the driving factors for the company are low fuel costs and an increase in vehicle sales and miles driven both domestically and outside the U.S.
"That creates additional demand for our product," he said, adding that sales growth, market penetration and new segments are all helping grow the company. Last week, Miller Industries reported net sales were $148.9 million, a slight increase compared to $148.8 million over a year ago. Net income in the first quarter was $3.8 million, or 34 cents per diluted share, compared to net income of $3.4 million, or 30 cents per diluted share, a year ago. Also, Miller Industries said it continues to work on capital projects at its Tennessee and Pennsylvania locations to streamline operations and increase manufacturing capacity to better meet customer demand. Jim Winsett, the BBB's president, said at the annual meeting that he's gratified to see how the 11 companies nominated for awards are conducting business on daily basis in an ethical way and with a level of integrity. He also mentioned the winners of the scholarship competition, adding that he's "more comfortable with who the future leaders will be in the country." Student winners were: Pressley Dawson, Seth Drey, Rachel McNabb, all of Marion County High School; Bradford Gaskill, Katherine Philyaw, both of Signal Mountain High; Alexa Fults, Grundy County High; Haleigh Isanhart, Boyd Buchanan School; Obinna Ilozor, McCallie School; Isaac Overfield, Georgia Cumberland Academy; and Mackenzie Wall, Chattanooga School for the Arts & Sciences.